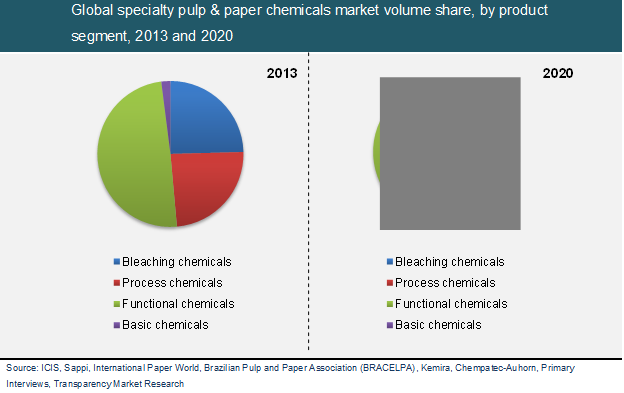 According to a latest report, published by Transparency Market Research (TMR), the global specialty pulp and paper chemicals market, which stood at US$18.67 bn in 2013, is expected to reach US$25.41 bn by the end of 2020. If the figures hold true, the global specialty pulp and paper chemicals market will exhibit a positive CAGR of 4.5% between 2014 and 2020. The report is titled “Specialty Pulp and Paper Chemicals Market - Global Industry Analysis, Size, Share, Growth, Trends and Forecast, 2014 - 2020” and is available on the company’s website for sale.